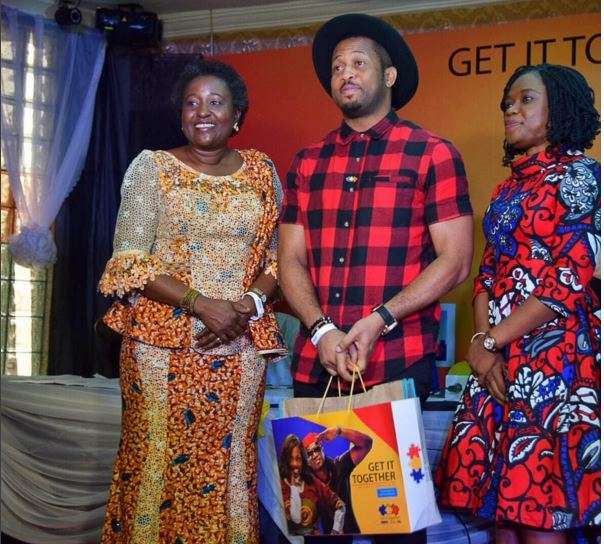 The Nigerian Urban Reproductive Health Initiative (NURHI) has joined other big companies in signing celebrities as ambassadors. Tiwa Savage, Paul Okoye, comedian Gordons and Nollywood actors; Mike Ezuruonye and Adekola Odunlade, have signed on as ambassadors for the Family Planning Campaign 2016. The campaign, themed “Get It Together”, will be officially launched with a music video that features the two musicians – Tiwa Savage and Paul Okoye. Tiwa Savage met Adekola Odunlade at the event and was starstruck by the Yoruba movie actor. “Get It Together” is aimed at raising awareness about family planning, emphasizing its benefits to men and women of reproductive age, increasing contraceptive use among women and increasing access to family planning services. This campaign is expected to better the previous family planning campaign in Nigeria themed “Wait For Me” which was launched in 1989. It kicked off with renowned artistes Onyeka Onwenu and King Sunny Ade releasing two songs titled‘Choices’ and ‘Wait For Me’, with the latter track sung in Pidgin. In November, 2015 Tiwa Savage and Paul Okoye shot a music video for the campaign. #WhyIStoppedWatchingNollywood Is All Shades Of Funny! #BBNaija: “I Never Manipulated Efe The Way Cee-C Does Tobi” – Marvis Speaks On Tobi & Cee-C’s Drama.